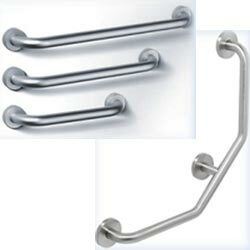 Epoxy coated or chromed, mild steel grab rails available in various sizes to suit your individual requirements. Products may vary slightly to picture, according to material. The Dog Leg Grab Rail is 3 rails in one. 3 separate angles ensure the best grip for lifting and lowering yourself. Ideal for next to a toilet. Supplied with installation rubbers, screws & plugs.